Sanur Beach in Bali Islands was a popular spot to holiday. Sanur Beach is one of the beaches on the island of Bali that interesting to visit. 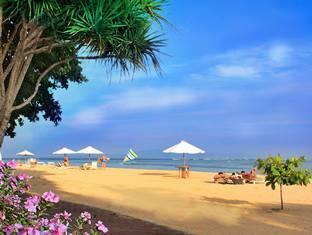 Made its natural scenic beauty of Sanur Beach is famous even since antiquity. In the history of ancient Bali, Sanur Beach has been known as beautiful beaches, it appears in the inscription of King Kasari Warmadewa, a king who berkeraton in Singhadwala in the year 917 AD Now, there are inscriptions in Blanjong region, the southern part of Sanur Beach. Let's Continue Reading about Sanur Beach - The Natural Scenic Beauty in Indonesia. In the Dutch colonial period, famous Sanur Beach as a landing site when the Dutch army will attack the Kingdom of Badung is considered insubordination on the colonial government. The war that occurred on 18 November 1906 it became known as Puputan Badung, the spirit of war to the death that was practiced by the King of Badung and his followers. In terms of tourism, Sanur Beach began to be introduced into the international world by A. J. Le Mayeur, an artist from Belgium who came to Bali in 1932. See the attraction of Sanur beach is very beautiful, the Le Mayeur decided to stay in Sanur by establishing a studio to paint. Le Mayeur Bali later married a girl named Ni Nyoman Pollok, a famous Legong dancer and is one of the models of his paintings. Through paintings Le Mayeur, Sanur Beach began to be recognized by the international community. Currently, the studio painting has become the Museum Le Mayeur and can be visited by the public. Le Mayeur Museum in Sanur Beach tourist area. In contrast to present the beauty of Kuta Beach sunset (sunset), Sanur Beach is famous for its beautiful panorama of the rising sun (sunrise). The topography of curved white sand beach that stretches to form a beautiful constellation. In the morning, while enjoying the moments of the rising sun is dazzling, tourists can see the group of islands of Nusa Penida in the southeast and the panorama of the south coast of Bali. The view in the evening is equally interesting. Reflux of sea water clarifying eye on the island cluster of attacks and rock hill that juts into the sea south of Sanur Beach. Not only that, if the waves are not so great, tourists can witness the beauty of the coral reef that stretches colorful. Sanur Beach is located in the village of Sanur, Denpasar District, Denpasar, Bali Province. Sanur Beach is approximately 6 km from downtown Denpasar, and can be reached by private vehicles like cars or motorcycles. If you want to use a public vehicle (bemo), tourists should not worry because public transport is very crowded and fro between the Sanur-Denpasar. Sanur is the region's first tourism development in Bali, characterized by the presence of star-rated hotels and various restaurants. 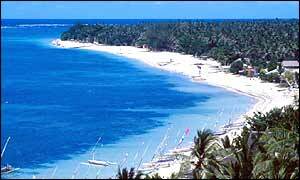 Therefore, tourists should not worry if you need lodging or food stalls in the vicinity of this beach. In addition, the tourist area of ​​Sanur beach also provides souvenir stalls that sell various items of art and by-the typical beach.